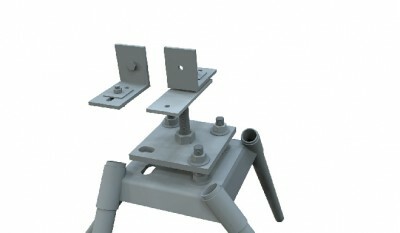 Surefoot is revolutionizing the construction sector. An economic, fast and high capacity way to provide building foundations. Based on a system of micro piles and patented pile caps (footing plates), Surefoot can eliminate concrete completely or drastically reduce its use, The system eliminates excavations and realizes savings in both time and costs. Surefoot is a micro pile, code compliant solution easily calculable using BS and Eurocode structural calculations. Surefoot is best described when compared to a trees root system. Surefoots micro pile and pile cap arrangment, spreads the foundation over a greater surface area achieiving larger load capacities faster and more cost effectively. The system is installed via steel tubular piles driven into the ground by a simple Jackhammer and attachement tool. Surefoots engineering principales are based on piling technology using a combination of skin friction and point bearing. The system can be used in any penetrable soil, sands, silts, clays, small gravels and even rock when drilled. Installation times range between 10 minutes to 45 minutos aproximately depending on which size Surefoot is employed. Adjustable in both plumb and level after your foundation is installed, Surefoot has instant bearing capacity in every direction so your works can continue that same say. The system is engineered to Eurocode standards and is fully compliant with structural Steel quality requirements, Surefoot is only ever used when designed by a structural engineer and a previous soil analysis has been performed. Surefoot micro piles solutions can handle large bending moment loads which means Surefoot can be used in a very wide range of applications. Close co-ordination with the design team during installation ensures a trouble free install. Frequent review of job progress and confirms that all piles are driven as designed and are adequate for the project requirements. Note the complete lack of mess, mud, excavation and heavy machinery. A two mean team, portable tools and less than 3 days for a two story house foundation.